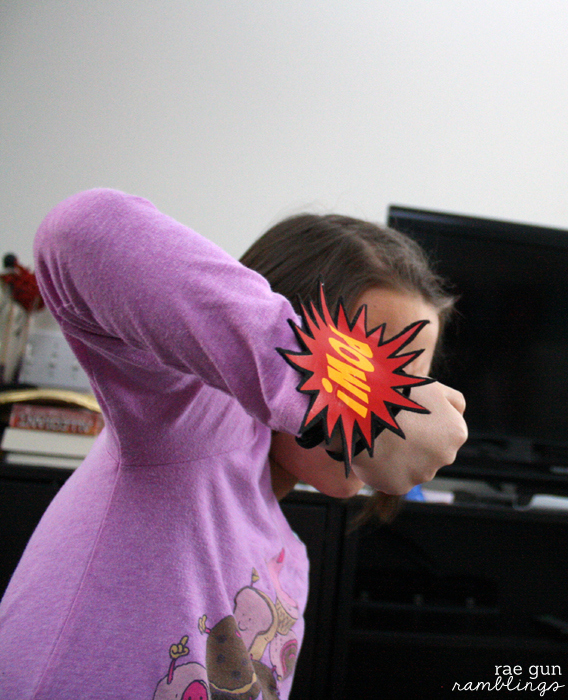 Niece T’s super hero addiction is going strong. 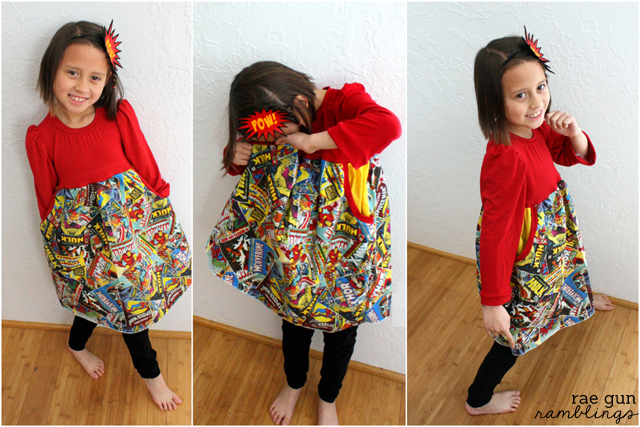 You might remember that easy Super Hero Tank Dress that I made for her last Spring. Well I don’t think I’ve seen that child wear an article of clothing more so when I saw this awesome comic book page Super Hero fabric at Jo-Ann Fabrics I snatched it up. 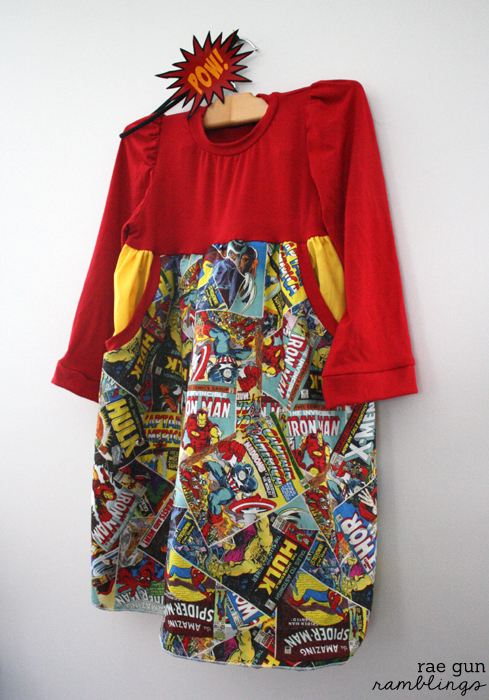 When I was given the chance to try out Go To Pattern’s Belinda dress I thought it would make the perfect new Super Hero dress and I was right. T is a big fan! 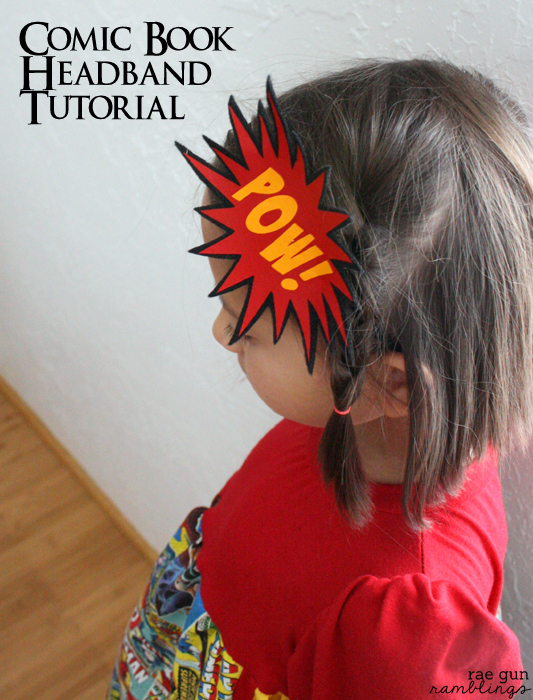 If you’ve been curious about the pattern it’s a really quick and easy sew. I love the pocket shape and that whole front panel is actually a giant pocket. The girls were totally enamored by this! 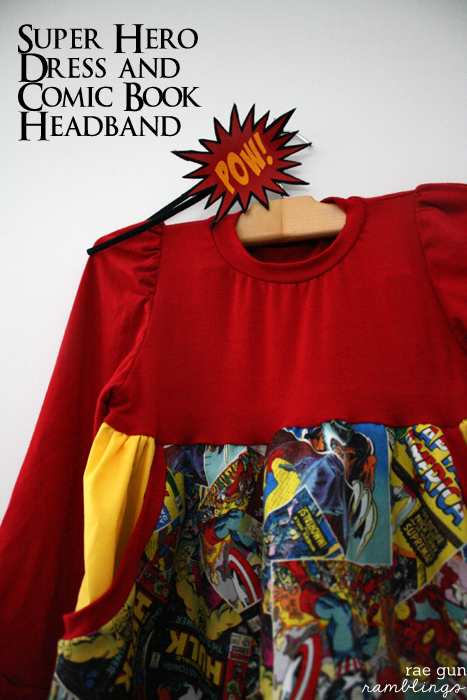 But of course I couldn’t just do the dress, this screamed a need for a fun comic book inspired headband. I was thinking Pow! or Boom! I found a good Pow! design in Cricut Craft Room as well as the fun start burst so I went with that. If you want to make your own it’s super easy. I used my Cricut to cut out your phrase and start burst out of Iron-On Vinyl (see this iron-on vinyl tutorial if you’ve never done that). 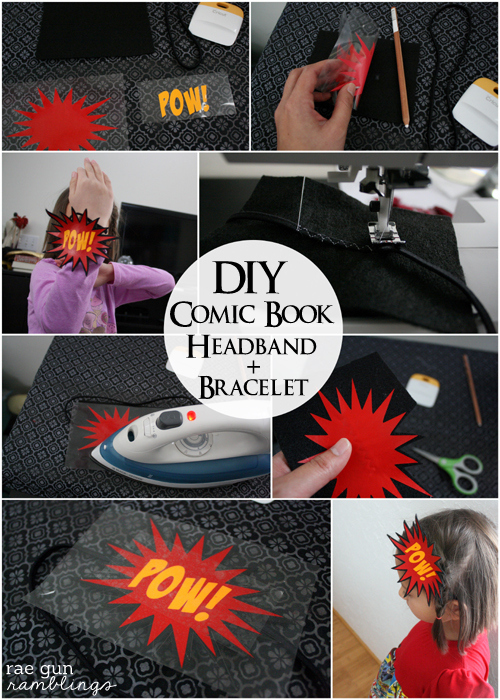 If you want it just like mine here’s my Cricut Craft Room file for the Pow headband. If you don’t already have access to the images it will just prompt you to buy them. Position your star burst onto a piece of felt (but do not affix yet) and mark where the points start. Remove the star burst. 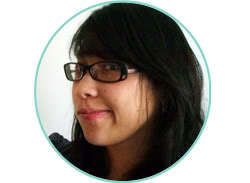 With a 3 step zig-zag stitch sew your felt piece onto an elastic headband between the markings. Iron the star burst onto a piece of felt. Cut around the star burst leaving a small boarder. Iron your phrase on. If the plastic does not cover the whole star burst use the plastic from the start burst and put it over the whole image so you aren’t ironing directly onto the vinyl. And don’t think this is just for girls. You can put the pow on something smaller or do like T and wrap it around your wrist a few times to make a fun bracelet perfect for play fighting! Pow! There you go. And if you have any questions about the Belinda dress let me know. Otherwise you can grab your own at the Go To Patterns Shop. X-men do have a ton plus I just like them better too :) T is currently really into the Dark Phoenix I love super hero loving girls! 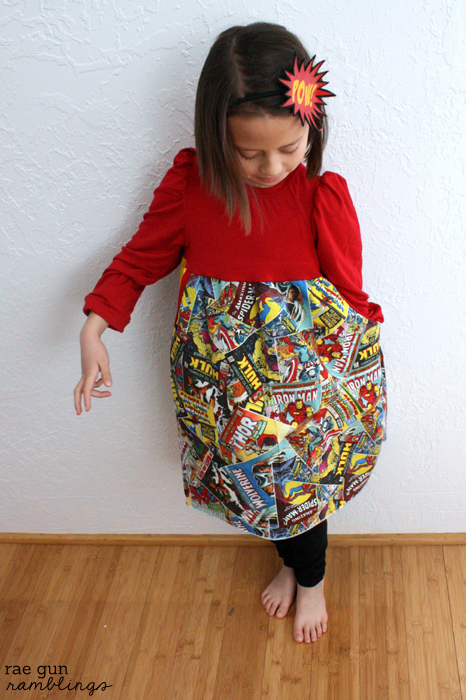 I love that this is super hero…I also love that it has pockets! So amazing! Where did you find the superhero fabric (or what is it called?) My brother has asked for a superhero quilt for my nephew. I am admittedly pretty ignorant when it comes to comics, but my brother is an expert. Jo-Anns and they actually have a good selection right now!